NEW: All themes are now completely free! Upgrade your phone’s keyboard to SwiftKey Keyboard for free and get more done without fussing over typos. Join over 250 million people worldwide who use SwiftKey for hassle-free typing. Replace your phone’s default keyboard with one that uses Artificial Intelligence to automatically learn your writing style, including the words that matter to you, the way you type and the emoji you use. That means autocorrect and predictive text that actually works. SwiftKey Keyboard caters for all typing tastes. Different colours, designs and themes. Support for 90+ languages. Tapping or swipe-to-type. Tons of emoji (smileys, emoticons). No emoji. 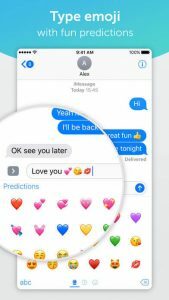 Or emoji keyboard predictions learned from how you’ve used emoji before.